Today you are two years old. As I begin to write this, it’s 9:27 p.m., which means that at this time two years ago, you were four minutes old. I knew right away that the 45 hours of pain I’d just finished were well worth it, and I feel that way more than ever now. Your daddy and I were overwhelmed by how amazing and beautiful you were, and we still are today. 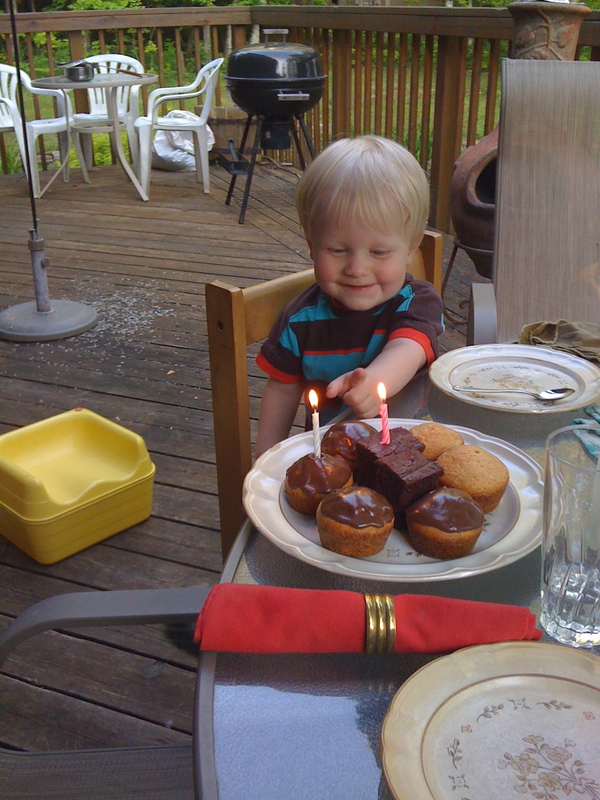 At two years old, you are so funny and brilliant and delicious, it’s hard to believe. In front of your beautiful jumbo birthday card on Sunday - thanks, Auntie Beth! Right now, you are quite a boy’s boy. You love trucks and cars and tractors and trains and all things with wheels; the day you got to see two different street cleaners was very exciting and you talked about it for many days after. I’ve learned to take note of special vehicles myself, even when you’re not in the car with me. (“Oooh, cement mixer, awesome! Wait a sec…”) You also love sticks and rocks and especially gravel – at the park, it ranks right up there with the swings and the slide for fun factor. You ask specifically to “go past the quarry” on our way home from the babysitter’s because it’s all gravel and big machines with wheels. Other things you love: markers and other writing implements (you like to scribble in circles and say “It’s a tomato!”), books (“Puddleman” is a big hit right now), movies (especially Cars), taking walks (whenever you get out of the car, you like to take a little stroll down to the end of the street), and, of course, the park. 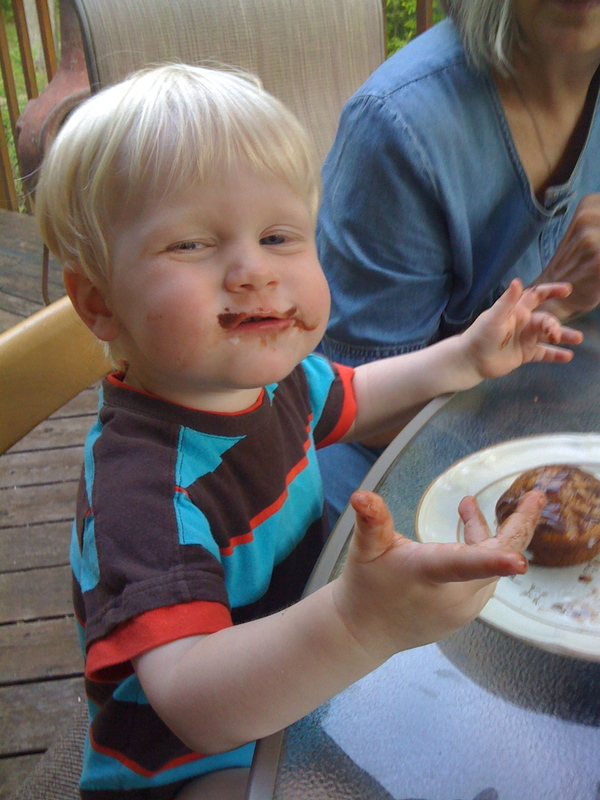 You mostly just ate the icing off. You are also incredibly sweet and loving. You are good at giving hugs and kisses, and you even give them to the baby who’s still in my belly. (We hope you’re starting to understand about the new baby – although sometimes if we ask you “Where’s your baby brother?” you lift up your own shirt and show us your belly.) You love people, especially “kids” – it makes your day when there are lots of kids at the park, or when we go to my school and see the kids. You remember people’s names with scary accuracy. In fact, you astonish people quite often with the way you talk. You speak in full sentences, using long words (such as “helicopter” and “rhinoceros”) and abstract conjunctions and idiomatic past tense forms. You have a little bit of trouble with the difference between “me” and “you” (I admit, it’s a tricky system), so you’ll say “It’s for me,” when you give something to someone else, or “Wanna carry you,” when you’d like to be picked up. (It’s cute, of course.) We never know what you’ll say next – it’s continuously entertaining. 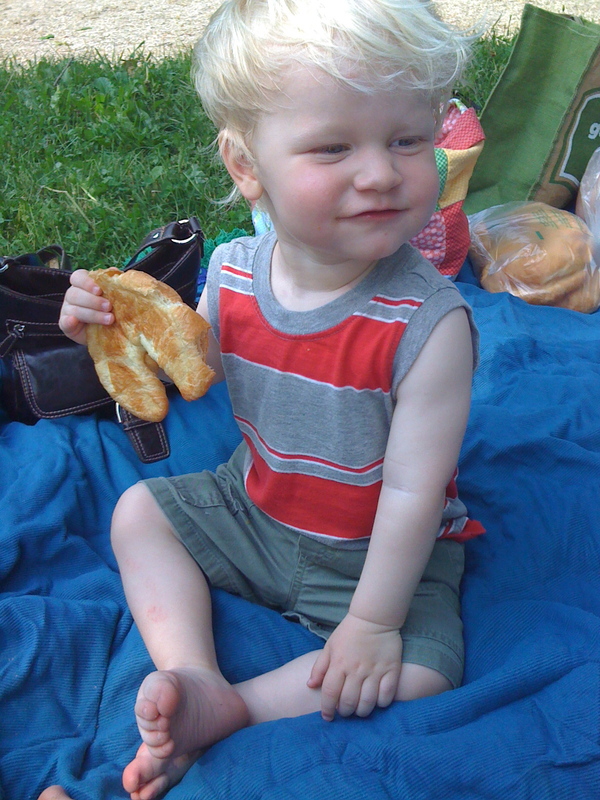 Birthday brunch at the park this morning - we love the way you say "croissant". Lots of people are wishing you a happy birthday today – we have celebrated with two sets of grandparents and aunts/uncles and will do so with the third soon… You’ve gotten lots of presents, and special cupcakes made by two different aunties, and so many happy messages from people who love you. Daddy and I are incredibly glad to be your parents, and we can hardly wait for you to meet your baby brother and teach him about the world. You are going to be a wonderful big brother. 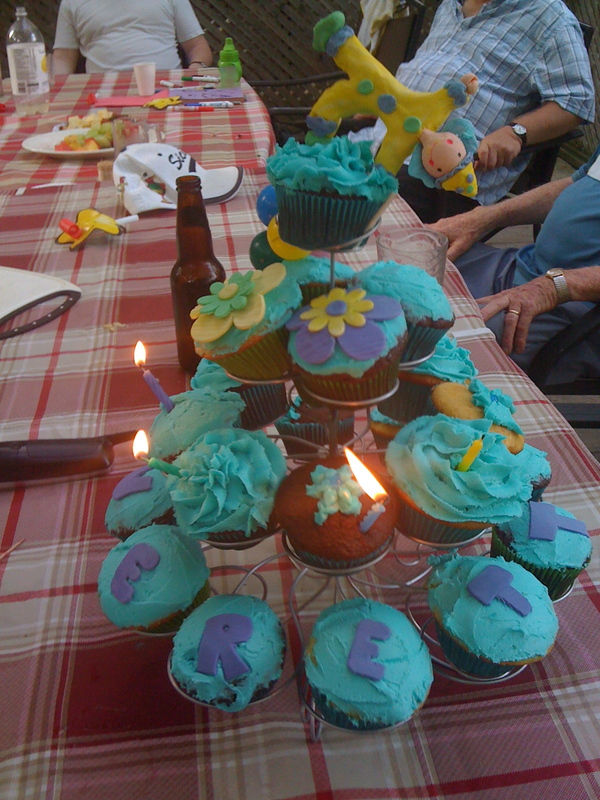 Gorgeous cupcake tree by Aunt Amy (you ate the "V", by request). We love you more every day, so much that it’s impossible to describe. Hugs and kisses forever. 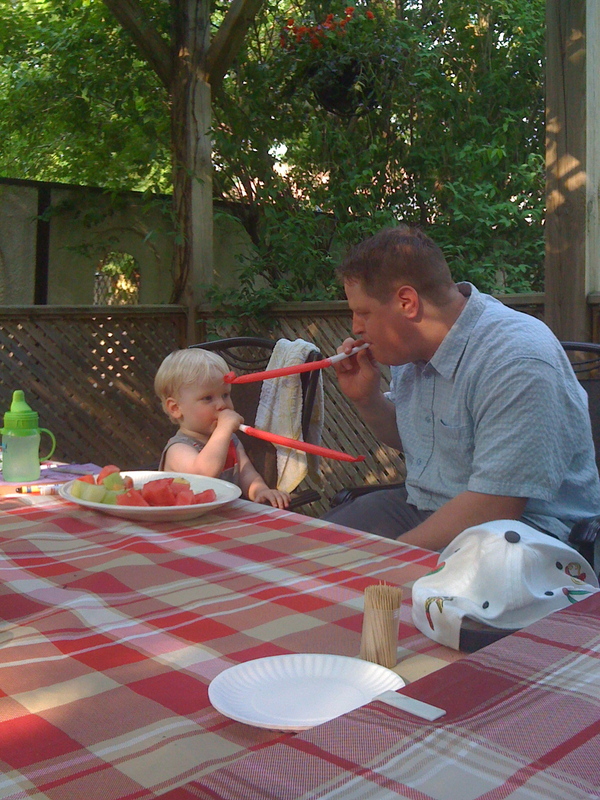 With Daddy at Grandma and Grandpa's house - you loved these blowouts! ← Oh, Internet, you’re SO FUNNY! Also, you’re frickin photoGENIC. I can’t resist you, ever. I don’t get anything done when you’re around (especially if you’re at the top of the stairs calling down “EHHHHmmy!”) and I can’t even regret it a little bit. I love you a billion. ahhhhh, what a charming chap. Happy, Happy Birthday,EEEEEEEEEEEEEEEE!!!!! We love you more than we can everett say! Great ruminations! Great photos! Remember on his first birthday when the “blowouts” made him cry? What a difference a year makes. 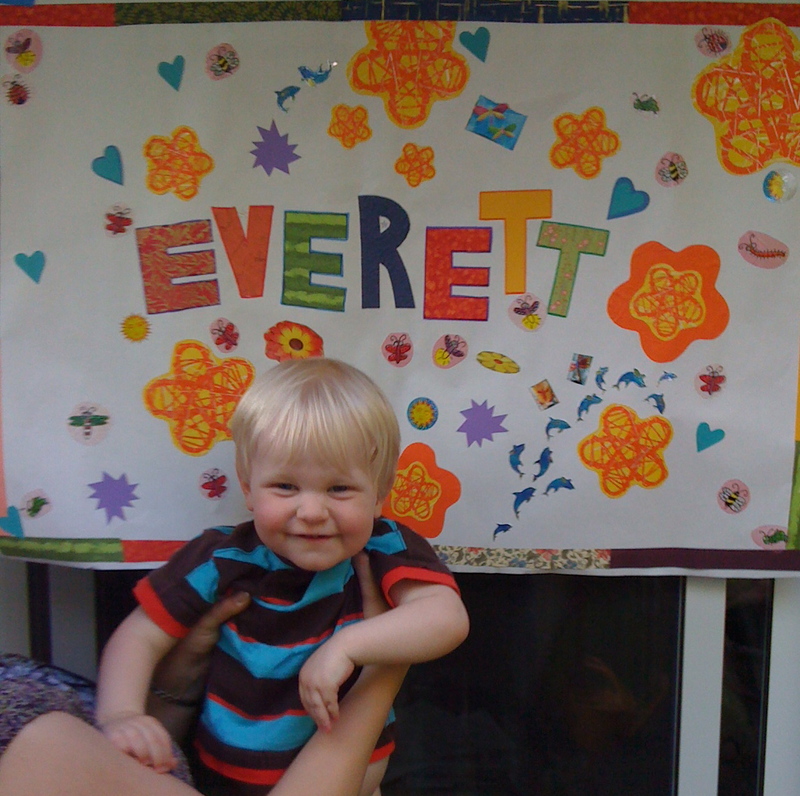 Hey, you forgot to say that he spelled out his name on that giant birthday card and then, when asked, “What does it say?”, replied, “Everett!” I l-l-l-love you, Everett! I LOVE you! I love YOU!